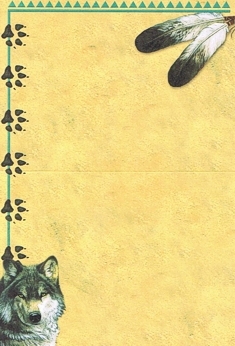 Pathfinder Wolf Notecard has the dramatic artwork of Nancy Wood Taber on the cover. The profiled running Wolves are embellished with foil. The inside is pictured below. It is blank so you may write your own greeting. Made in the USA. Comes with a sand colored envelope.